At Learn And Explore, we focus on developing communication skills, social/emotional skills, thinking skills, and physical skills. As a result, children enjoy the self-confidence and problem solving abilities they need for learning success in a safe, supportive, nurturing, and stimulating environment. Children are encouraged to engage in “hands on” experiences that lead to learning through discovery, recognition of logical consequences, organization of thoughts, facts, and problem solving. This approach is called “whole child” development and is critical for paving the path towards school readiness and beyond. Welcome to the Learn And Explore Preschool . As a parent of three precious children, I know what it means to entrust your child’s care and nurturing to others. Choosing an educational program for your child is one of the most important decisions you will ever make. As a result, I sought to create a learning environment with a single vision in mind – providing a personal journey of knowledge and experiences for every young child. I have worked in the education space for over 12 years as a Special Education teacher, academic enrichment provider, and an Education Director. These professional experiences, coupled with a Masters Degree in Early Childhood Education, laid the groundwork for the creation of Learn And Explore – a high-quality, safe, and accessible preschool. By developing and enhancing the foundational abilities and skills of the “whole child”, we are able to promote knowledgeable, compassionate, empowered, and socially and emotionally intelligent learners. The commitment we have towards the care of your child is reflected in every aspect of our facility. The physical layout, décor, the curriculum, and the selection of staff have been approached with enthusiasm, expertise, and profound care. The result is a high-quality learning environment that meets the needs of our children, parents, and community. Thank you for taking the time to get to know more about our program. I would love to meet your family and welcome all of you into our family. Please feel free to contact me personally with any questions or call to set up an appointment. Introducing you to Learn And Explore Preschool would be my pleasure. 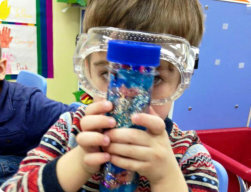 VISION – Learn And Explore is a preschool with a single vision – providing a personal journey of knowledge and experiences for every young learner. MISSION – Developing and enhancing the foundational abilities and skills of the whole child with the purpose of promoting knowledgeable, compassionate, empowered, socially and emotionally intelligent learners. PHILOSOPHY – Learn And Explore’s approach to early childhood education is rooted in sound and proven pedagogy and practice principles. Exploration and discovery is used as a way of learning, enabling children to develop confidence, creativity, and critical thinking skills.